Learn how to force the bank to accept your short sale offer. If you are wondering why the bank will not accept your short sale, think about it from the Bank's perspective. Does the Bank have any incentive for accepting your short sale offer? Your short sale offer must be in the Bank's best interest before the Bank will even consider your proposal. I have heard many stories from Tampa, Orlando, Ocala, Jacksonville and Daytona Beach about the Bank's agents and employees saying "we will modify your loan after you are behind on your payments for 3 months". This is somewhat deceptive because most people do not know that their home is going to be foreclosed upon once after 90 days of delinquency. But there is a little bit of truth to the statement. Once you have fallen behind 90 days and you are in foreclosure, then the bank is losing money and your loan is now non-performing. NOW the bank has incentive to work towards some compromise! First off, the Bank’s primary concern is growing their money. The Bank wants to have a performing loan. This means, if you are making timely payments, the loan is performing. Why on earth would the Bank lower your payments or accept a short sale if you are making timely payments? They have nothing to gain by lowering your payments or accepting a short sale. In no way am I advocating that you fall behind on your payments or fall into foreclosure, however, this is just basic logic. Also, if there is a second or tirtiary mortgagee (i.e. you have multiple loans with multiple banks), your chances of having a short sale approved are greatly diminished. The problem is the other Banks will lose their entire investment if they allow the primary Bank to accept the short sale. In a short sale, the first Bank will reap all of the reward of the short sale, and the secondary Banks will not receive any benefit. Once again, use common sense. How can you convince the second Bank that it is in their best interest to accept the short sale. Perhaps you can offer them settlement money. Or maybe you can offer them a contract that admits you will owe them the entire loan amount, even after you have done a short sale. Or maybe you can use a combination technique of offering them a fraction of the money you owe them with a contract that admits that you will still owe them the remainder of the loan amount after the short sale. Once again, my disclaimer, I am not giving you advice to fall into foreclosure. However, I am telling you that the Bank will become more negotiable and lenient once they are wasting time and losing money due to the foreclosure process. The Bank does not want to have an R.E.O. (real estate owned - by the bank) on their books. The bank wants a performing loan. The Bank also knows that a foreclosure defense lawyer can slow down the foreclosure process to a crawl. A foreclosure lawyer can gain you several months of time to negotiate with the Bank. 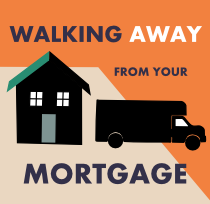 The longer the foreclosure process, the more money the Bank is losing because of attorney's fees, litigation costs and the lost earning potential of the property due to the non-performing loan. Also, the Bank knows that you may even file Bankruptcy at the end of your foreclosure defense which will slow the foreclosure process down even more. Always remember that Bankruptcy is your LAST resort. Always fight your foreclosure first because you can always file Bankruptcy. If you file Bankruptcy, you can no longer fight the foreclosure. Foreclosure defense should always come before Bankruptcy to maximize your chances of keeping your home! Many times short sale offers fall through due to the slow response time of the Banks. Of course the bank has a plethora of short sales and a pile of REO's (real estate owned by the bank) to deal with which doesn't make the process any easier. It can sometimes take the bank 6 months or longer to get around to responding to your short sale offer. During this time most prospective buyers decide to find another home to buy. First, you need to ensure that you are fighting your foreclosure so that your home is not foreclosure upon while you are awaiting a response from the bank. Second, make sure you have someone who is following up with the bank to ensure that your short sale offer is under consideration. Many times your foreclosure lawyer can follow through with the Bank's attorney to ensure that the short sale offer is being reviewed. If the bank is so slow that your deal falls through, particularly if this is on a regular basis, the Court may construe that the bank is acting in bad faith. 2) a realtor who is familiar with short sales. Your foreclosure attorney will ensure that the foreclosure process is slowed to give you enough time to complete the short sale process. The foreclosure attorney can also consult with the Bank's attorney and ensure that your short sale offer is adequately considered by the bank. Your realtor will obviously help list your property on the MLS and find a buyer. Your realtor will help draft the "as is" short sale contract which should immediately be sent to your foreclosure attorney who can help expedite the short sale process. Devise a team to slow your foreclosure and aggressively push through your short sale! 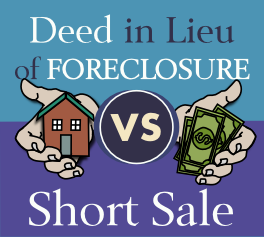 Learn the differences between a short sale and a Deed in Lieu of Foreclosure. How do they compare? Is one better than the other? Both will negatively affect your credit rating because the loan was “not paid as agreed”. Use Bank Logic: What do they want?